Jenny Oaks Baker is one of America's most accomplished classical violinists. Whether her music is experienced live or through one of her many recordings, it is impossible to escape the magic of her artistry. Ms. Baker began playing the violin at age four, and made her solo debut in 1983 when she was only eight years old. Since then, she has thrilled audiences throughout Europe, Asia, and the United States with performances equally powerful in emotion and mastery. In April 1999, Ms. Baker made her Carnegie Hall debut as a featured soloist in the Easter Festival Concert. She has also performed as a soloist in Alice Tully Hall at Lincoln Center, in the Coolidge Auditorium at the Library of Congress and at Strathmore Hall. In 2005, Ms. Baker soloed with the National Symphony Orchestra at the Kennedy Center under the direction of Marvin Hamlisch. A past guest soloist with the Jerusalem Symphony, the San Diego Symphony, the Utah Symphony, the Orchestra at Temple Square, and the internationally acclaimed Mormon Tabernacle Choir, Ms. Baker has been featured in television and radio broadcasts nationwide, as well as Time Our for Women events. Additionally, she was a guest artist in "An Evening of Celebration," an internationally televised concert honoring Gordon B. Hinckley, President of the Church of Jesus Christ of Latter-day Saints. On Wings of Song, Ms. Baker's debut solo album, released in 1998 and Songs My Mother Taught Me followed close behind in 1999 with another well-regarded premier. Her third album, Where Love Is offered a stirring collection of inspiring love-themed songs, and in 2001 collaboration with pianist Jenny Richards resulted in American Tapestry. Ms. Baker’s next recording, The Light Divine, released in 2003 and The Best of Jenny Oaks Baker has remained a bestseller since its 2005 release. In 2007 Ms. Baker released her first Christmas album, O Holy Night, and in 2008, Silver Screen Serenade, a magnificent collection of the film industry’s most spectacular theme songs, showcasing even more of her extensive and moving repertoire. In 2010, Ms. Baker will release album number nine, Then Sings My Soul, a stirring collection of favorite hymns and classics. Ms. Baker's albums have sold more than 100,000 copies, charted on Billboard, and garnered multiple Pearl Awards from the Faith Centered Music Association including Song, Album, and Artist of the Year. With her extensive performing and recording careers in addition to her superlative education, Ms. Baker is an esteemed expert and served as a judge for the 2007 Stradivarius International Violin Competition. In April 2008 Governor Jon M. Huntsman Jr. of Utah awarded her the Governor’s Mansion Artist Award for excellence in artistic expression. Jackman Music have published The Jenny Oaks Baker Violin Collection - Volumes 1 and 2 as well as The Jenny Oaks Baker Christmas Collection. These three books of sheet music, by a variety of arrangers, were inspired by the music of Ms. Baker's albums and feature advanced arrangements for violin and piano. For seven years Ms. Baker performed as a first violinist in the National Symphony Orchestra before resigning in 2007 to devote more time to her young family. 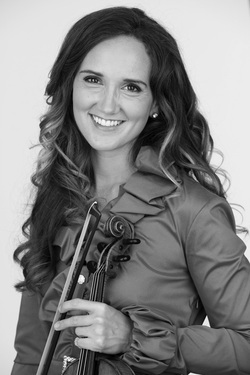 She received her Master of Music degree from the renowned Juilliard School in New York City and earned her bachelor's degree in violin performance from the prestigious Curtis Institute of Music in Philadelphia. Ms. Baker, her husband, and their four children reside outside of Washington D.C.
For more information about Ms. Baker and her upcoming appearances please visit www.jennyoaksbaker.com.